I think that it is obvious from the poll on this site that the only mode supported by the majority is LRT, why anything else is being considered is beyond me. The Main/Bailey intersection is already difficult to navigate and congested in rush hour. Adding BRT will exacerbate this condition. BRT just isn't a good option for this route. 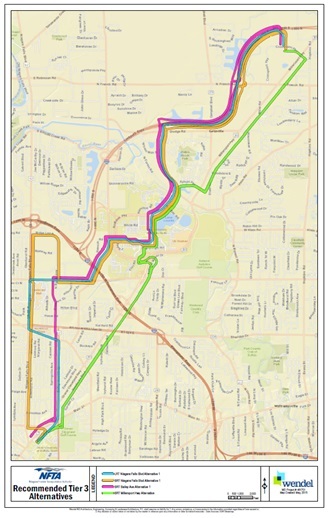 The Tonawanda Line, however, WOULD be very good option, having a dedicated ROW with few cross streets and a lower population density makes it the ideal place for the BRT experiment. The comparatively slow acceleration of buses is the reason people find light rail to be "fast". Both modes need to stop less frequently, but the LRVs can be better at acceleration (particularly the rebuilds!) and they ride a whole lot smoother (better suspension system, more mass dampening) than the buses. Like it or not, buses cannot be made as cost efficient, environmentally friendly, or quiet as the LRVs already are. BRTs are only marginally cheaper to implement and have higher operational costs. They do not make sense for operation over one fixed route. They require more operators (drivers) for high density/low headway and temporary high demand situations. With LRTs, you just add another car (up to 4 currently, or equivalent of 4 buses) to each train in high demand periods, no additional personnel required. Electric power in WNY is cheaper than in most other cities, while highway fuel here is more expensive than the national average by a significant margin (even in bulk). With Hydro-power easily available, this is a major selling point. Tires on buses need to be replaced frequently, and the concrete wears faster due to the weight. Until recently the rails downtown were the same ones in use since the 80s. Rail wheel wear out in years, not months, and they don't wear out the road surface. As for which LRT route to choose, that's not nearly as easy. 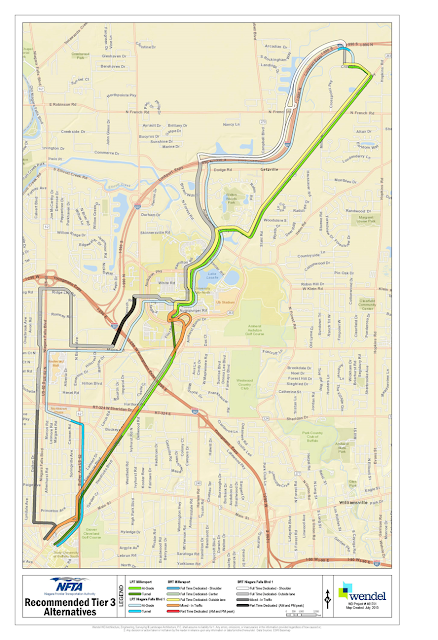 If the NFTA is looking into cutting costs by eliminating the portion of LRT between UB North and Crosspointe, the study should also be amended to have the LRT continue underground for the entire portion of the routing. As another commentator pointed out above, this system could potentially mix with traffic at areas that are not grade separated (for example, Eggert and Niagara Falls Boulevard), and cause traffic bottlenecks. Certainly if four miles area already underground, another four can't be that bad. The trains would in turn completely avoid the most congested intersection in upstate NY (NY 324 & US 62) and give passengers the comfort of being able to get out of the train and stay warm during the brutal winter months en route to class at UB North or shopping at the Boulevard Mall, if the Bailey extension is chosen. Underground is much, much, much more expensive than on-the-surface. Like, at least 5 times more expensive to build, and twice as expensive to operate (because of elevators). Stay on the surface, because that's thee only way to get it *done*. Both rail and BRT are possibilities for all those corridors. Some may end up light rail or streetcar, others bus. Route 1 and I-66 could even include Metrorail extensions. testo drive 365 If you don't want to operate out and if you cannot discontinue your cherished goals with regard to the intake of cakes, unhealthy meals, chocolates, ice-creams & alcohol, you shall get thinner in your sweet dreams only. • Weight decrease by competition-- seems very interesting, also very true! • Fat individuals are in search of a magician! They want instant weight-loss.